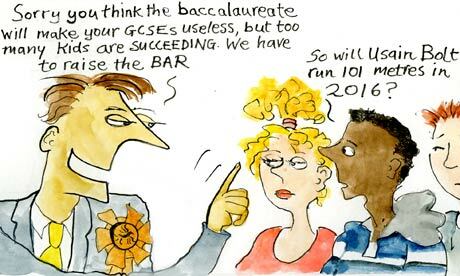 The joke above, borrowed from The Guardian, comes at a time when Borris Johnson is also reported for voicing his support for Grammar Schools. I can see the arguments against each, why shouldn't all children have the same opportunities and the same challenges. At the same time our refusal to acknowledge that some children are better logico-linguists than others seems unfair. I am reminded as I write of my only outing playing GAA for a local team. I was awful, and the Manager never invited me back. The same should be said for academia, or the 100 metres. Usain Bolt would not be challenged to compete if all entrants to a 100 metre race were entitled to a gold medal. Similarly young academics will not be challenged to learn if the bar to success is set too low. Our education system must be designed to serve all.